Contains NO pesticides! 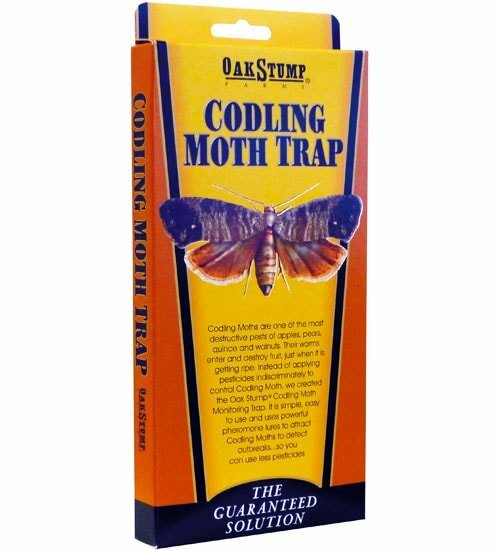 The Oak Stump Farms Codling Moth Trap includes everything you need to capture the leading cause of “wormy” apples. Once in place, these flying pests are attracted inside and become stuck on the sticky surface. 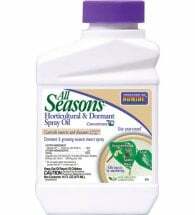 Effective without toxic chemicals or pesticide residues! 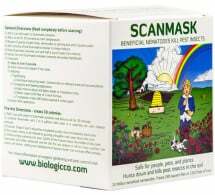 • Pesticide free — NO chemical residues! Simply place the specially formulated attractant inside the upper glue surface and hang 1-2 weeks before bud break, in spring. If protecting several trees, hang them around the perimeter where insects are most likely to enter. Adults (3/4″ wingspan) of this common apple pest are gray-brown in color and have a dark patch on the tip of each fore-wing. The larvae are pinkish white maggots (1/2″ long) that burrow through fruit directly to the core, leaving brown frass and tunnels. For best results, use an integrated approach to pest control. 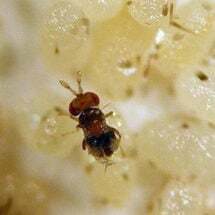 Trichogramma Wasps will destroy the eggs before tunneling larvae can appear. A superior type parafinic oil that degrades rapidly and has almost no toxicity. 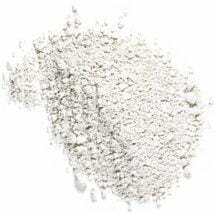 Applied as a liquid, Surround WP – kaolin clay – evaporates leaving a protective film.